Rachel TRACEY made a welcome return to our events programme and treated us to some sights, sounds and scents as she delved into the life and work of three French women, Coco Chanel, Catherine Deneuve and Audrey Tautou. The star of her talk though was the connections all three had with the perfume, Chanel No.5. Rachel reminded us that 2009 was a year in which two films on the life of Chanel appeared. The first Coco avant Chanel starring Audrey Tautau chronicled Chanel's early life and was followed by Coco and Igor, the story of Chanel's liaison with the Russian composer, Igor Stravinsky. Several biographies were also produced, Karen Karbo's The Gospel according to Coco Chanel and Hal Vaughan's Sleeping with the enemy - Coco Chanel's secret war. Rachel highlighted Tilar Mazzeo's The secret of Chanel No.5 as having particular relevance to the evening's talk. Mazzeo compared Chanel's creation to Frankenstein's monster - not in a grotesque or derogatory way but rather both creations end up defining their creators. Rachel outlined Coco's early life as a seamstress, moonlighting as a cabaret singer. Her song of choice was Qui qu'a vu Coco which is most likely how she got her nickname. On to 1908 and meeting the love of her life, Arthur "Boy" Capel who financed her first shops and supposedly inspired many of her fashion designs and the shape of the iconic bottle for No.5. There followed a series of facts and figures including one from the French embassy which calculates that a bottle of the famous perfume sells somewhere in the world every thirty seconds. The sheer volume of sales has earned the perfume the nickname of Le Monstre. Rachel recounted the story of how the perfume was created and we were treated to connection with the Catherine di Medici, the Romanoffs, Ernest Beaux, Tsarina Alexandra and Galleries Lafayette! It was surprising to learn that the product did so wełl in its early years despite the fact that there was no no marketing until the 1940s and it was during the Second World War that sales flourished. Chanel closed her fashion house as she believed, "Wartime was not the right time for fashion". She was able to sit out the occupation in rooms at the Ritz hotel in Paris. At that time, apparently unaware to Chanel, the perfume was being produced in a factory in New Jersey by the Vertheimer Brothers who being Jewish had fled France in the early period of the Occupation. Chanel charged that the product was no longer the original fragrance as created by her and could not be endorsed by her. Her efforts didn't succeed as No.5 had been transformed into a symbol of a pre-War time and a token of affection from soldiers and their sweethearts back at home. Rachel then took us to the 1960s, to the world of glossy magazines and high fashion journals that depicted No.5 as the ultimate feminine accessory. By the 70s however the brand had lost much of its "Frenchness" and some serious revitalisation was needed. Catherine Deneuve was chosen as the new face of Chanel. Much to the delight of some in the audience we looked at an early advert. There was no doubt that the actress epitomised the qualities Chanel was promoting in her designs and perfume. Next we turned to Audrey Tautau as the face of Chanel. Participants were struck by the physical resemblance of Tautau and Chanel. Rachel made the point that Audrey's face is a "double signifier" standing both for herself and for Coco. Another advert followed and we were treated to an exploration of its finely detailed homages to Chanel. The talk, as is usual, ended with questions and comments; many of those present recounting when they got their first bottle of the fragrance - clearly treasured possessions. And although it is an expensive product, Rachel had brought just enough to ensure that everyone was misted with the fragrance before being "scent" on their way. Here is a link showing programmes of the wide variety of French clubs, including our Cercle, supported by the Alliance Française de Londres. The origins of this talk by Hélène GUILLET & Philip McGRORY date back to an idea of then French President, Nicolas Sarkozy to mark Ireland's tenure of chairing the European Union. The President had the idea of an exhibition charting connections between the two countries. The exhibition was set out in a series of panels with commentaries in English, French and Irish. We were therefore honoured that the person tasked with providing the French translation was none other than our speaker, Hélène. We were taken on a tour from virtually the dawn of recorded history, through the arrival of the Normans, onto 1690 and the Williamite and Jacobite wars and to the flight of the Wild Geese. Numerous names of notables reinforcing the Franco-Irish connection were mentioned. We had Sir Francis Beaufort, of wind scale fame, connections of the Mac-Mahon lineage and Richard Hennessy, an Irish officer serving in the army of Louis XV who went on to establish the renowned cognac house. Have you ever been under the Arc de Triomphe and looked up at the 600 names commemorated there? 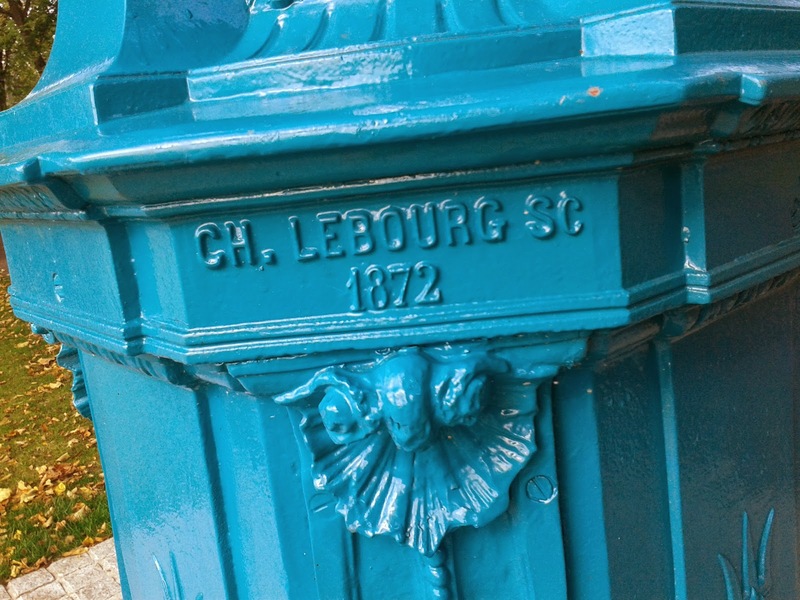 Some of them are of Irish connection so next time, check out Charles Edward Jennings de KILMAINE inscribed on column 5 of the Northern pillar and Henri Jacques Guillaume CLARKE on column 11 of the Eastern pillar. Sir Richard was also a philanthropist donating 2.5 million francs for the relief of poverty and he also provided the legacy of Wallace Fountains, enduring symbols of Paris and of which there are two remaining from the original five in Lisburn.